Namaste Yoga is produced by Namaste TV, a Canadian-based company which offers yoga videos for television and online sites such as YouTube. Here in the US, I became familiar with Namaste Yoga years ago through the cable channel FitTV, where I would sometimes catch glimpses of beautiful female yogis gracefully flowing through vinyasa sequences. The shows that I watched were likely from Seasons 1 or 2, which were choreographed and narrated by Kate Potter. Namaste TV has finally released a third season, updated with a new lead, Erica Blitz. According to her web site, Blitz combines the yoga styles of vinyasa, Ashtanga, and Anusara in her teaching. In the introduction to each Namaste Yoga episode, she (I presume) describes Namaste Yoga as a "moving meditation" and a "return to our essence." There are six episodes on this DVD, which is Part 1 of the third season. The episode titles are listed on the Main Menu, but unfortunately, the title provides little information as to the focus of that particular routine. However, each episode has a submenu which includes a more descriptive phrase (I have included these in parentheses below) as well as options for Play All -- Introduction -- Warm-Up -- Main Sequence -- Cool-Down. All practices are approximately 22 minutes long. 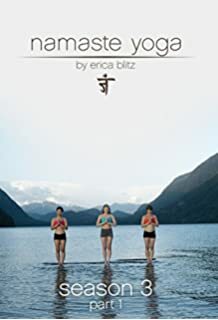 As noted above, Erica Blitz narrates the routines, and the postures are modeled by approximately six different female yogis, sometimes featured in groups of three, sometimes singly, mostly in attractive outdoor settings (but a few indoor as well). See below for details. Warm-up includes all-4s balance work with thigh stretch and elbow-to-knee, down dog/sphinx flow and cobra/up dog flow. The main sequence moves from mountain pose wide into warrior 2 with eagle arms, peaceful warrior, side angle pose, and triangle pose. Concludes with a very brief (1m) shavasana. Warm-up starts with half sun salutes plus a chair/forward bend flow. The main sequence again starts in mountain pose wide and moves into warrior 2 and exalted warrior; there is also a twisting series with revolved low lunge, revolved chair, and revolved triangle. This section ends with boat pose and bridge. The cool-down includes a repetition of bridge, hamstring stretches, and half happy babies pose. The warm-up begins in a seated cross-legged pose for a twist and a forward bend. The main sequence moves from mountain pose into a lunge and twisting lunge. Next, standing poses flow from warrior 2 to side angle and triangle and then warrior 2 to exalted warrior to warrior 1. The cool-down includes bridge, hamstring stretches, and reclined bound angle pose. The warm-up begins in a seated cross-legged pose for a twist and a forward bend, then moves to all-4s for cat stretches with a lifting of the knees. The main sequence continues on all-4s for balance work with thigh stretch and elbow-to-knee. Additional vinyasas include down dog/sphinx flow, cobra/up dog flow, and a chair/forward bend flow, but otherwise, there are no standing postures. This section concludes with bridge and reclined pigeon, and then the cool-down includes wide legged forward bend and twist, full forward bend, and shavasana. The warm-up here again starts in a seated cross-legged pose for a twist and a forward bend, then moves to all-4s for cat stretches with a lifting of the knees; this is followed by down dog and plank pose. The main section also starts with the same all-4s balance work with the thigh stretch and elbow-to-knee. Gate pose follows, and then the lunge/twisting lunge flow. Also included in this practice were revolved prayer twist, eagle arms, and lizard lunge. This episode begins kneeling in hero's pose, adding a twist. Next is a slow flow from child's pose to modified plank pose to cobra pose. This time, the sequence with bridge, hamstring stretches, and half happy babies pose appears in the main part of the routine, whereas the cool-down offers knees-to-chest, a twist, and shavasana. This DVD in general and the episodes in particular have stellar production values--the scenery is often gorgeous, the picture quality flawless (apparently filmed in 4k), and both the voiceover match and the sound quality are excellent. Yet in practicing these routines, I found them to be a bit lacking. Notice that in my descriptions above, several segments are repeated. This was my main disappointment--i.e., the footage is NOT unique to each episode. Various sequences appear over and over, sometimes in the warm-up, sometimes in the main body of the routine. Similarly, I found that there was little variety amongst the episodes--evidenced not only by the repetition of flows, but also by the repetition of themes--e.g., some version of "hips" is featured in four of the six episodes. There certainly are some yoga practitioners who might readily relate to these routines; perhaps for experienced beginners who 1) don't like to hold poses, 2) enjoy frequent short vinyasas, and 3) prefer repetition to variety. I think that for many yogis, however, better choices are available.